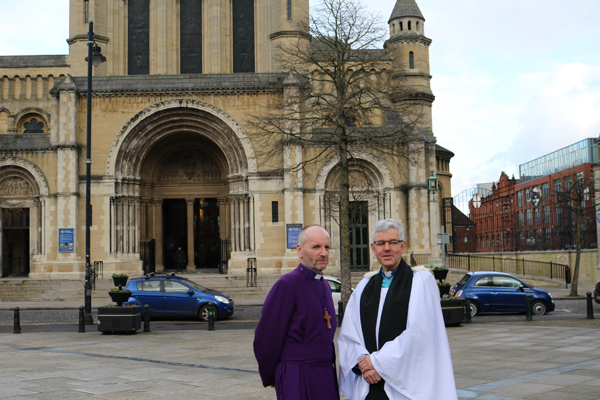 Dean Stephen Forde and the Bishop of Connor, the Rt Rev Alan Abernethy at St Anne’s Cathedral for the service of installation and institution. 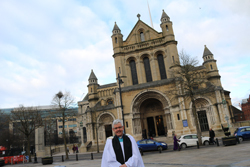 The 14th Dean of Belfast, the Very Rev Stephen Forde, was installed in St Anne’s Cathedral in a joyous and uplifting service of Choral Evensong on Sunday February 4. 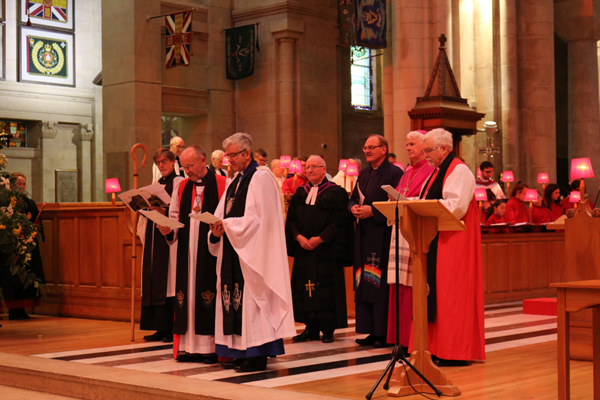 The service was attended by the Bishops of Connor and Down and Dromore, representatives of community life in the city, visiting Bishops and leaders of the other main denominations in Northern Ireland. Family and friends and many former parishioners from the Larne area was also present. The service followed the order for Choral Evensong, and was led by the Cathedral Choir and the Larne Concert Choir with the St Cedma’s Singers (Larne Parish). Members of the Brass section of the Ulster Orchestra helped to make a joyful noise. The former Dean of St Patrick’s Church of Ireland Cathedral, Dublin, the Very Rev Victor Stacey, read the first lesson, and the second lesson was read by the Deputy Lord Mayor of Belfast, Councillor Sonia Copeland. The preacher was the Bishop of Connor, the Rt Rev Alan Abernethy. Dean Stephen Forde signs the declarations during the installation and institution. 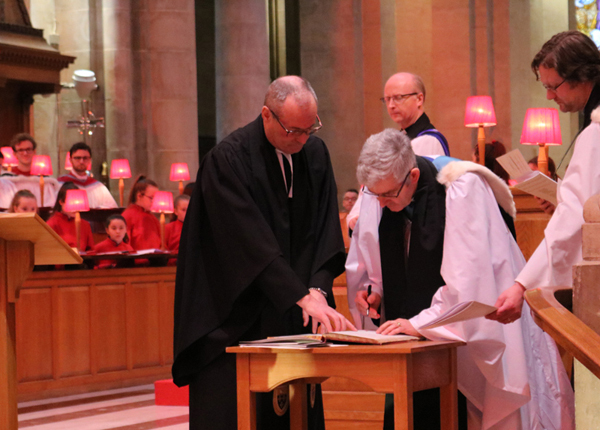 During the service, the Dean-elect was presented for institution into the Cathedral Parish by the Archdeacon of Belfast, the Ven George Davison, and the Act of Institution was conducted by the Bishop of Connor. Archdeacon Forde was installed as Dean of Belfast by Archdeacon Davison, accompanied by the Bishop of Down and Dromore, the Rt Rev Harold Miller. He was then presented to the people by the Bishop of Connor, and welcomed by the Very Rev Martin Graham, Administrator of St Peter’s Cathedral, on behalf of all the church leaders. The formal institution and installation of the new Dean was followed by the commissioning when the Dean was presented with symbols of the teaching, pastoral and sacramental ministry of an incumbent. These included a Bible (to preach the Good News of Jesus Christ), a container of water (recognising that the Cathedral is a place of Christian baptism), a Book of Common Prayer (demonstrating the primary role of the Dean to lead public worship and encourage a life of personal devotion), bread and wine (the elements of holy communion), oil (symbolic of healing and reconciliation), the key to the Cathedral (as a reminder that the Cathedral is a place to be kept open for all people) and a towel (as a reminder of Christ washing his disciples’ feet and of the ministry of service and support of those in need and in trouble). Prayers of thanksgiving and intercession were offered by clergy from the Larne area: The Rev Dr John Nelson, Ballycarry Non-Subscribing Presbyterian Church; the Very Rev Aidan Kerr, PP, Larne; the Rev Chris Skillen, Larne Methodist, Fr Conor McCarthy, curate Larne; and the Rev Dr Colin McClure, First Larne Presbyterian. 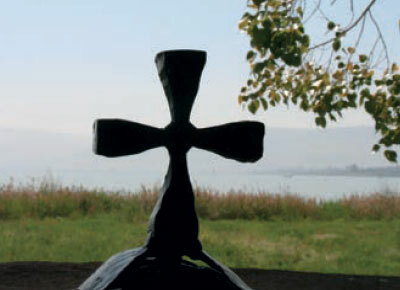 The Benedictine Monks of the Holy Cross Monastery, Rostrevor, sang the responses. During the service, there was a collection for Belfast Cathedral’s Black Santa Sit-out. Speaking ahead of the installation, Dean Forde said: “With the redevelopment of the Cathedral Quarter, and the arrival of 10,000 students at the University of Ulster, this is a time of new beginnings and new horizons. “I hope the Cathedral will be a place where people who are rushed and hassled by life’s demands will find rest and refreshment, a place of peace in a world of many pressures. I also hope the Cathedral will be a place of ecumenical encounter, a place where bridges are built and barriers dismantled. Above all, I pray this will be a place where people discover how much they matter, because they will discover how much they matter to God. “While I am excited at these new opportunities, I am also conscious that being Dean of Belfast is a massive challenge and a daunting task. 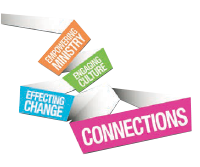 I approach this new role, knowing that will I need the prayers and support of so many others: The staff at the Cathedral, the Cathedral community who call this place their spiritual home, and also support from the wider community in Belfast, as well as from the clergy and people of the two dioceses that this Cathedral serves. The new Dean is congratulated by Church Leaders. Bishop Abernethy’s said those gifts included the Dean-elect’s joyful faith, his ability to enable creative liturgy and music, to help others discover and use their gift and to understand and follow procedures and processes. He said the new Dean would imaginatively use the buildings as tools for the Kingdom, and had a keen awareness that mission and ministry has to be self-sustaining. Refreshments and speeches followed the service. Dean Stephen Forde outside St Anne’s Cathedral. Dean Forde, 55, was born in Banbridge and grew up in Rathfriland, Crossgar and later Belfast. He was ordained a deacon in 1986 and a priest in 1987. He was educated at Campbell College, Belfast; the University of Edinburgh and the Church of Ireland Theological College. He is married to Fiona, a Staff Nurse at Antrim Hospital, and they have two daughters Rachel and Amy, and a son, Michael. Dean Forde was curate assistant at St Mary’s Parish, Crumlin Road, Belfast, Diocese of Connor, from 1986-1989 and was Chaplain at Queen’s University, Belfast, from 1989 until 1995 when he moved to Dublin Diocese as incumbent of the Grouped Parishes of Booterstown and Mount Merrion. 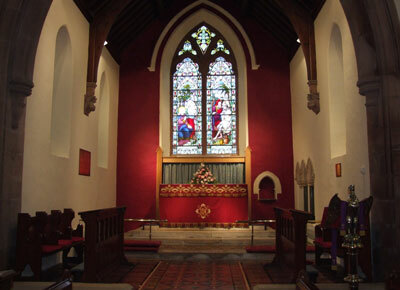 In 1999 he returned to the Diocese of Connor as rector of the Parishes of Larne and Inver with Glynn and Raloo, where he saw through the completion of three major building projects, with the total restoration and refurbishment of Glynn Parish Church (1999-2000), and Raloo Parish Church (2005), and a significant extension to Glynn Church in 2012. 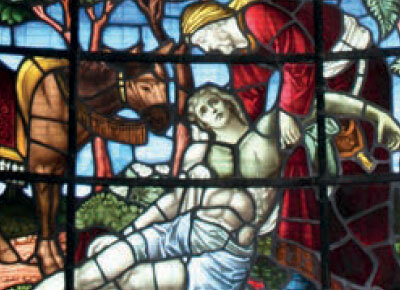 The medieval church of St Cedma’s, Larne, which dates to 1350, was sensitively adapted to meet disabled access requirements, and the church roofs and tower were repaired last year. 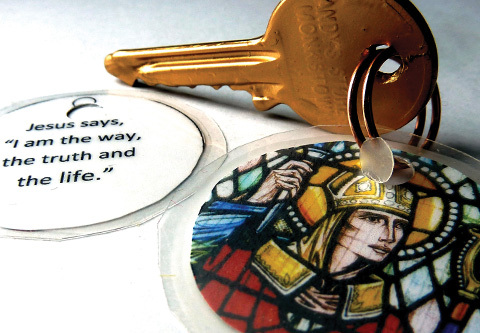 Since 2011 Dean Forde led a major project to build a new parish hall complex at St Cedma’s. Dean Forde, whose primary degree is in Architecture, has been a member of the Connor Diocesan Architecture and Buildings Committee since 1999. 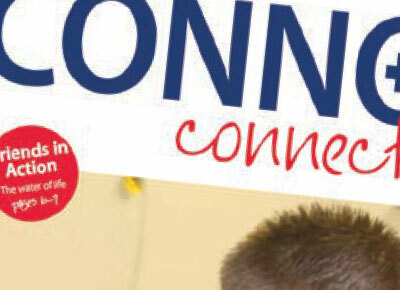 In his ministry he has been chair of Connor Council for Mission, a member of the diocesan Training Council, a Rural Dean, a member of the Church’s Advisory Committee on Training and Ministry and he served as Domestic Chaplain to the Bishop of Connor from 1991-1995. He was a Minor Canon of St Anne’s Cathedral from 1989 to 1991. Outside of ministry, Dean Forde was chair of Larne High School Board of Management from 2004 to 2007. He is a former Campbell College chorister and a former member of the University of Edinburgh’s St Cecelia Singers. The Dean’s interests include music, hill walking, cycling, photography, travel and reading.